The Oracle of Napoleon: divination, Secret Code, or Both? The Oracle of Napoleon is one of the most involved divination systems I have ever encountered. Unlike other methods of divination – such as dice or cards or a pendulum, which can be easily carried in a pocket or a handbag – the Oracle of Napoleon demands that you have a set of questions that go with a chart – called “The Key” – which then the querent needs to further refer to another set of charts – it’s almost as bad as doing your taxes before we all had Turbo Tax and we had to refer to charts and booklets and try to figure out mysterious codes. Indeed, I never would have reviewed this “method” of “divination” at all – except that I couldn’t think of anything else to write about this month. So I opened up The Fortune-Teller’s Workbook by Sasha Fenton and tried to make a go of it. Right off the bat, I was annoyed. After writing about the supposed history of the Oracle, and how she “modernized the instructions but left the interpretations in their original forms” (36), she goes on to tell us how to go about obtaining the Oracle’s wisdom. First, the “Enquirer” has to make five rows of dots on a page without thinking about it – “purely by chance” – as she puts it and those italics are hers, so we know this is an important point. But – at the same time, we have to stay cognizant of the fact that each line has to have at least eleven dots – those italics are mine. So while we are not paying attention to placing the dots on the page, we are also paying attention to how many dots we are placing on the page. Which doesn’t make sense. I thought, why not just put five or three or seven or how many you want on the page? But I did it as instructed. But of course I had to pay attention. There’s no way to consciously put eleven dots on a page and not pay attention to that fact. So then you count all your dots in each line. If a particular line has an odd number of dots, you place a single dot at the end of the line. If the line has an even number of dots, you place two dots at the end of the line. So then you have a pattern of single & double dots. You then turn to the page with all the questions on it. I also thought this was strange. What if your question wasn’t one that was on this list? But I chose one and I continued. 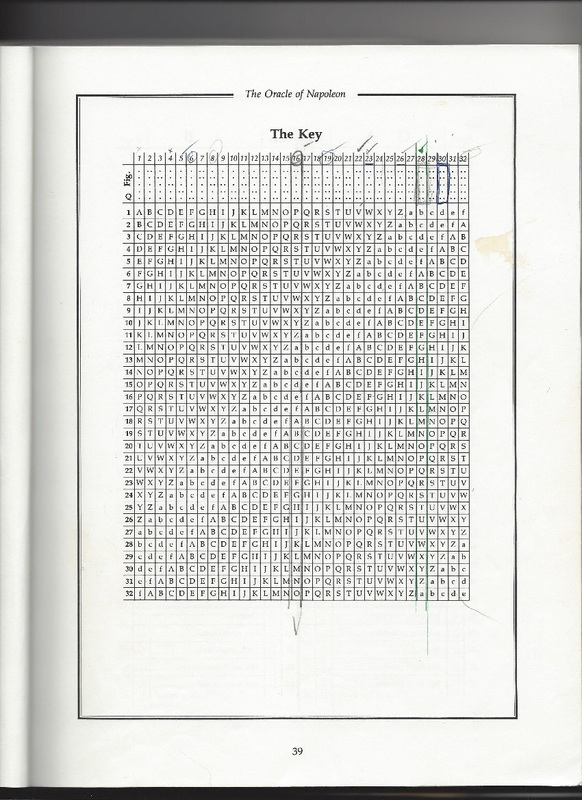 So then I had to find the number that matched the pattern of my dots on “The Key”. As you can see, the patterns of my dots match up to number 26. So I matched it up to my question and looked it up in the book. I thought it was a little off but not out of the ballpark. I thought a better way of choosing your dots would be rolling a single die. Any odd number that came up would be one dot and any even number that came up would be two dots. Any soldier would have a pair of dice with him and Napoleon was a soldier. I tried this a few times and I thought it worked much better. 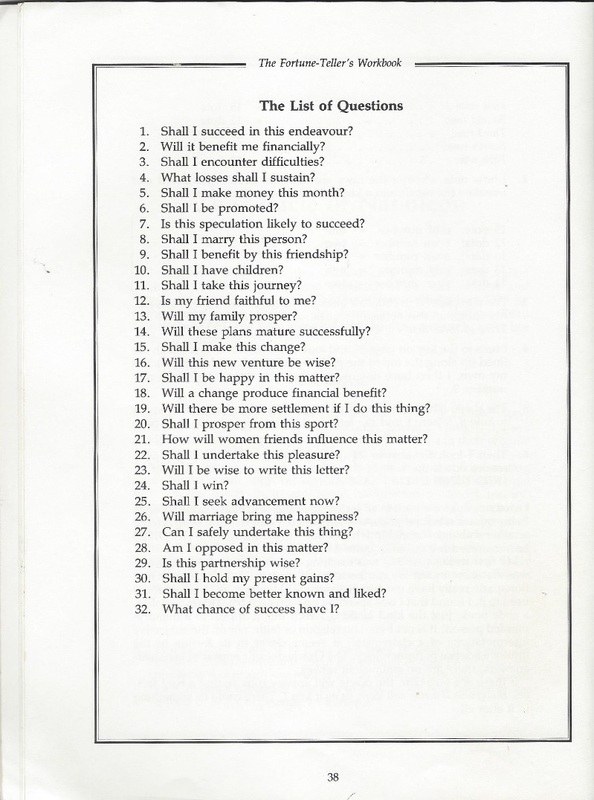 Even so, it seems like an awful lot to carry around with you – all these charts and list of questions and what-not. And why would Napoleon – the General of the Revolutionary Army, the Emperor of the French, a man who was educated in the rational and reasonable rhetoric of Rousseau and Voltaire be doing using such a superstitious method of arranging his affairs? First of all, the wording is vastly different than what we see in Fenton. Of course, she did say she “modernized” it and I think she may have been working from an entirely different edition. But what intrigued me was the use of italics. Not only on the “Questions” page but in the “Oraculum” section. What if those words had meanings other than what was written there? In terms of a military or political code? 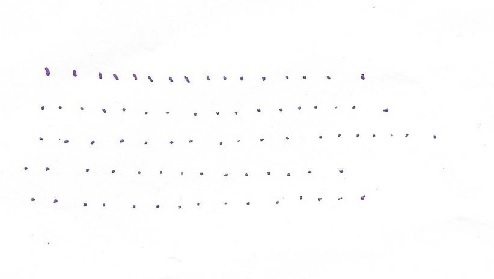 I looked again at the piece of paper I had with my dots on it. It seemed silly to me – at first – to have eleven dots before I started putting down dots but when I looked at the piece of paper, it started to make sense. What if I was a courier for the army and this was all I had in my pocket? Nobody but the person with the key would know what I was carrying. Perhaps I would be told to ask a specific question. Let’s say, Number 25 on Napoleum’s Oraculum. “Shall the patient recover from illness?” – Will the army recover from the recent loss? – or whatever it means. When you think about it, this is a brilliant code. I also found a website where you can ask The Oracle of Napoleon questions in real time and get real answers immediately. It’s called “Napoleon’s Book of Fate” and it’s at http://www.e-tarocchi.com/bof/index.php. Try it out – it’s a lot of fun! So far from being initially annoyed, I found myself being totally intrigued and I have to say that now I want to find out more about secret codes and how they mix with oracles and divination in general. It brings another layer to this subject that I never thought about. Seeing the signs – in lines of dots!